Have you ever been to a glow stick party? I’m not talking about the parties you go to that are blasting techno music and you have all those weird people twirling around glow sticks while they’re high on ecstasy (is the proper term “high on ecstasy”? I don’t know, I’ve never done the stuff). 3 Piles of Glow Sticks? Anyway, last Saturday I went to a bar/club with a date. When we got to the place I first had to pay a cover charge. I seriously hate cover charges. If I wasn’t on a date I would’ve probably left. Right when we entered the bar there was a large table with three different piles of glow sticks on them. The first pile had green glow sticks, the second pile orange glow sticks and the third pile had red glow sticks. So what did the colors mean? You were supposed to take a green stick (I don’t feel like typing the word glow anymore) if you were single, an orange stick if you were single but shy and a red stick if you were taken and in a relationship. Being that I was on a date I had to take the red stick and wear it around my neck all night. I thought this was a pretty cool idea since I got to watch guys crash and burn all night as they tried to pick up women. What does this have to do with real estate investing? As always, I’m hurt that you even have to ask. 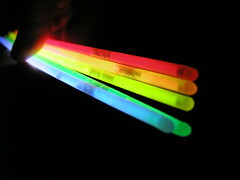 What was the point of the three glow stick colors? To obviously separate us into different categories so that the single people knew who they could target. How many of you in your marketing pieces really narrow it down so that you target your ideal prospect? And when I say really, I mean it. Far too many of the direct mail pieces that I come across are general in nature. They basically say that “we buy houses, sell to us today”. I can promise you that the more specific and more targeted your mailings are, the more leads you will get. And getting quality leads is the whole point of this business, isn’t it? I’m never surprised when I’m sitting at the kitchen table with a seller and I see a stack of mailings from other investors–yet, I’m the one who is there closing the deal. It’s because I spend a lot of time thinking about my prospect and targeting my mailings to make them feel like they’re the only people in the world who are getting my letter. So before you send out your next mailing piece make sure that you’ve done everything you can to increase response rates. Especially because the cost of stamps just went up. Jason — Allow me a ringing endorsement. The last 20+ years I’ve used direct mail, much of the time in spite of the derision aimed my way by fellow brokers/agents. What I found almost immediately to be most successful was two crucial elements — a very narrow target audience, and a highly detailed, content/info rich message. I hated the no-call list at first because it crowded the mailboxes of real estate owners everywhere. But soon enough, the traffic died down — very few had a clue as to what would make the phone ring. BawldGuy Talking’s last blog post: You Own Free & Clear Land — It’s Not Selling — What To Do?